Why not have some fun?! It always feels great to have some fun!! So without further ado enjoy a fun post!! Notice the title on this post? Because I purchased $211 worth of clothing from Children’s Place for $31!!!! $211 worth of brand new, brand name clothing for $31! which also means 2 months out of work. Our income has been cut nearly in half. But I know, He always provides. He will not let us go without. I know to be still. That everything will come in His timing. This was just another one of those times where I walked out of the store smiling because He knew exactly what we needed, when we needed it. Oh how good He is! 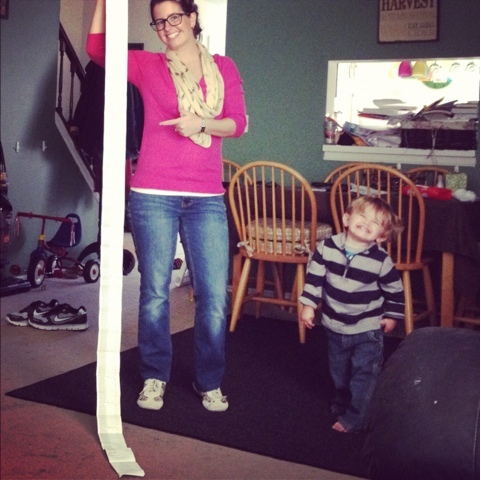 When we got home I made Mr. Three take a picture of me with the receipt because it was just hysterical how long it was! WOWZAH!!!! that is amazing!!! how faithful is our God, huh?! and your little one over there in the corner of that picture is TOOO adorable! !